More than a year ago, I started towing gliders for Atlantic Soaring Club at Harford County Airport (0W3). It was quite on accident that this happened. I own a 1975 Cessna 177B Cardinal and for a year, it was tied down outside. My tiedown spot was directly across from the glider club's clubhouse and base of operations. Over the course of that year, I became pretty good friends with a few of the club members and they would routinely invite me over for hamburgers and hotdogs when i'd return from flying the Cardinal or just go out to work on it. One day, they were talking to me about how busy they'd been. The club was doing Civil Air Patrol Cadet orientation flights, the two days prior and they were commending their tow pilot John, on how much hard work he put in with no relief either day. Casually I asked, “what? Do you guys not have enough tow pilots or something?” to which they said “yeah, we only have three total and one of them is our chief glider instructor so on the days he tows, no instruction takes place.” That seemed a little odd to me and I just said “Well, I dont know what the requirements are or anything, but I'm at least tailwheel endorsed.” Well, about 2 weeks later, I get a phone call from one of the members and was asked the question “hey, are you're still interested in helping out at the glider club? we'll be flying this coming Saturday, come and hang out and we might get you up in the Scout to start learning how to tow”. That was how it all started. Since then, I've logged over 130 glider tows and I've become a much better pilot. The first thing you learn about glider towing (besides about the rope, and tow rings, etc.) is speed control. For most of the gliders I tow, 60mph is the target speed. You'd think this would be easy, but I have to admit that my first dozen tows probably had the glider pilots second guessing their choice of tow pilot. On a busy day, I'm looking out the window for planes in the pattern, sky divers coming in to land, NORDO aircraft (and our airport has a few), student pilots, other gliders, the glider i'm towing (in the mirror), ground references, and, oh yeah, my altitude and airspeed. Like any instrument rated pilot will tell you, if you look away too long, your airplane isnt going to be doing what you thought it was doing when you look back at the instruments again. But what I found has happened to me over the past year, is that airspeed starts to become intuitive. You can feel the plane speeding up and slowing down. You can hear the airplane speeding up and slowing down. Thats not to say I dont look at the airspeed, I surely do, but my attention no longer needs to be micro-focused on the airspeed indicator. What this has also done for me, is made me an attitude reference pilot. In the Scout, as well as the other airplanes I fly, mainly my Cardinal and a rented Piper Arrow II, I can set a power setting, choose an attitude, and fly my desired airspeed, whether climbing, or descending, and especially in the pattern when coming in to land. This brings me to number two. The second thing I learned from towing gliders, was how to land. Yes, I knew how to land before, but flying a tailwheel airplane, in often gusty wind conditions, with a 200ft long rope behind you, and coming in to a 2000ft strip with obstacles on the approach WILL get your heart beating a little faster. Now, I know all too well about setting up a stabilized approach to a short field landing and having that airspeed control I just talked about, helps immensely. I can now consistently aim for a spot on the runway and land within plus or minus 50 ft of it nearly every time. In fact, when I took my ASEL commercial checkride recently, my 180 degree accuracy landing was absolutely textbook, and all I can say is “Thank you Atlantic Soaring!” The third thing towing gliders has taught me is to look for traffic. Our airport can become somewhat of a zoo on the weekends. We have a very active skydiving operation at the field, as well as an active flight school and a sightseeing operation. It is not uncommon to have one or two skydive airplanes taking off, another landing, two or three student pilots in the pattern, parachutes landing in the middle of the airport, one or two no radio (NORDO) planes taking off or landing, transients, and upwards of two gliders nearby while I'm towing up a third. Somehow, we don't all kill each other and its thanks to pilots who know how to look out the window. Often times, i'll pass two or three other airplanes on my tow up to 3,000 AGL, and its important for me to position myself, and the glider behind me, in such a way as to ensure there is no conflict. There are many other things towing gliders has taught me, but I felt that those were the three big ones. So now, as I prepare for the CFI initial checkride in just a few short weeks. I look forward to another year of towing gliders, and hanging out with my awesome engineless buddies at ASC. I know I havent posted hardly anything lately, but that is because I have been working on passing my IFR checkride! YEAY! I wrote up a nice IFR Oral Exam and Checkride thing just like I did for my private and that will be in the Useful Information section again but I thought I would post the details of the checkride exam here so you dont have to go downloading a PDF. Enjoy! The checkride turned out to be a looong long ordeal ofhaving to cancel the flying portion of the exam right after the oral,due to unforecasted weather, rescheduling again when the CDILocalizer/Glideslope stopped working and the plane went into theavionics shop, and then rescheduling again, I was ready to be done.As it turned out, my unlucky streak was not over as the day I wasscheduled to take my checkride, the forecast changed to strongafternoon thunderstorms. However, Bill was very generous and offeredto meet me at Chester County Airport 2 hrs earlier than I hadoriginally scheduled. Once I got to Chester, Bill and I sat down to make surethat all the paperwork was in order to finish the flying portion ofthe exam. He got on IACRA and resumed the test. We then sat down andtalked about the approaches that I would be doing and what exactlythe expectations were for the flying portion of the exam. Basicallyhe just wanted to reiterate the Instrument Practical Test Standards.He told me the approaches that I would be doing and I asked if Icould have 5 minutes to look over each one and to tab them withsticky notes so that I wouldn't be fumbling around in the planetrying to find them in the approach plate book. He agreed. Afterthis, we went out to the airplane. Although I had pretty much justlanded, I told him that I was going to perform a very quickpre-flight/walk around just to make sure all was OK with the planebefore we took off. He said “Very good, you aren't doing anythingthat I wouldn't do, go right ahead!” We then got into the airplaneand I got my kneeboard set up with my timer on my knee and mychecklist book on my left knee. He liked the fact that I was usingthe checklists and reading off everything out loud. He then told me that we would not be actually talking toATC, but that he would play the part of ATC and that I should pretendthat it is no different from the real thing. He was expecting me tomake all my calls as I usually would. We taxied to the run-up areawhere I completed my run up and before takeoff checklists. During theradios and avionics check, I got out my first approach plate and putin all the appropriate frequencies for COM and NAV, set up the GPSwith a flight plan from Chester to Modena, ILS rw 29 into Chester,New Garden, and then Chester again. This way I wouldn't have to doany GPS programming in the air. Bill didn't say anything, he just letme do my thing. From there I said to him “Philadelphia Clearance,Cardinal N177SM, requesting IFR clearance to Chester County” Hegave me a simulated clearance, I copied it down and I read it back tohim correctly. After that he said “Cardinal N177SM, cleared fortakeoff runway 29, climb maintain runway heading for one and one halfmile before turning on course” I repeated this back to him. I thenmade my real call to Chester traffic that I was departing runway 29and proceeded to Taxi onto the runway. Then I hear Bill yell “STOPSTOP STOP!” I stopped. He said “Always hold short of the holdshort line!” and I said to him “ummm, you just said 'cleared fortakeoff,' I checked base and final and made my call that I wasdeparting” he insisted that he still wanted to see me hold short ofthe hold short line. I said “ok, sorry” then he said that I couldgo ahead and depart. This kinda broke my concentration a little. We then proceeded to take-off and when I had reached200ft AGL he said “my airplane, go ahead and put on your foggles”I did and then he gave me the controls back. After reaching 1.5miles, I turned left, identified the Modena VOR, turned the OBS andproceeded toward the VOR. I made sure to tell him to check left andright for me before I made my turn. He liked that and said that hewould be sure to clear me from here on out before I made any moreturns. As I was heading to the VOR, he proceeded to vector me out alittle ways before telling me to head direct to the Modena VOR. Hehad done this to see what kind of entry I was going to make into thehold. The angle that I was on was technically atan angle where a teardrop entry would be appropriate, however therewas a 20-25 knot crosswind (go figure) and so I had about a 10-15degree cross wind correction going and so to make things a littleeasier, I thought that I would just do a direct entry. Really, eitherentry would have been appropriate since I was on that odd, 30-ishdegree angle relative to the hold at the VOR. He asked me “whattype of entry are you going to use?” I said “I am doing a directentry” He then said “are you sure about that?” not wanting toshow any sign of second guessing myself or give him the idea I wasunsure of myself I said, “either a teardrop entry or a direct entryinto the hold would be appropriate, a direct entry is a little easierwith this direction of crosswind and so I am going to do a directentry” He said “the AIM recommends that on our present interceptheading, we should do a teardrop, I want to see you do a teardropentry” I said “OK” and proceeded inbound. I was very methodicalin my turn, time, tune, throttle, talk doing things very slowly,which he commended me on saying “many people like to rush rush rushand do everything real quickly, you are taking your time and beingmethodical, I like that, you don't want to be rushing when you are inthe soup for real”. My holding went perfectly. He then vectored meto final saying “Cardinal N177SM, upon crossing the Modena VOR,turn left heading 350, maintain 2500 until established on thelocalizer, switch to airport advisory on 122.7, cleared for the ILSrunway 29 into Chester County” I repeated this back to him andproceeded inbound. I tuned and identified the Localizer and when itcame in, I proceeded inbound. Those needles never even moved. It wasprobably the best ILS I'd ever done. Once we reached the DAhe told me to just quick look up to see how well I did and then to gostraight into the missed approach. I climbed out and turned back tothe VOR totally forgetting to hit the OBS button on the GPS so itwould auto sequence for the missed approach, but he didn't notice (ordidn't care) since I was doing VOR navigation anyway. We then enteredthe hold at Modena and proceeded to do the VOR runway 24 approachback into New Garden. I made sure to not only have a TO/FROM flip onthe VOR but also positive course guidance before making my decent. Hesaid that a lot of people start their decent right after the TO/FROMflip but don't wait for positive course guidance which he says he'sfailed some people for depending on how they tracked inbound to theVOR. I then descended and asked him if I could just descend topattern altitude rather than the MDA and he said he wanted to see mego down to the MDA. I then proceeded to level off the the nexthighest whole 100 ft above the MDA so I wouldn't bust it accidentallydue to a downdraft or something. The MDA at New Garden is 940 ft, Ileveled off at 1,000ft. He didlike that though. When my timer expired he told me to look up. I hadexpected to see New Garden right on my nose since the needle wasperfectly centered but I didn't, I had only a second or two panicattack (in my head) since I couldn't see the airport, but then Ispotted it at about my 10 o'clock and 2 miles. He said “very good!Nice VOR approach, go ahead and bring it in for a full stop landingand we will get ready to depart and do some unusual attitudes” Iwas relieved and made a nice smooth crosswind landing. As we taxiedback, I got out my next and final approach which was going to be theRNAV (GPS) rw 29 into Chester. We then departed and I once again putmy foggles on at 200 ft AGL. We climbed up to 3000 ft and he said “myairplane” and I gave him the controls. He then said “put yourhead down and brief the GPS approach out loud to me” and I did. Icould feel him maneuvering the airplane around but my briefing theapproach definitely did a good job of distracting my attention fromtrying to follow along with his climbs, descents, and turns. He thenasked me some detailed questions about the approach and asked aboutif it was a TAA GPS approach and if so, how could I tell. He asked mewhat a TAA approach does and I explained it to him. He then said “OHNO! You were flying around in the soup and spent too much time withyour head down in the approach plates! You're in an unusual attitude!Recover the airplane! Your have the controls!” I was in adescending left turn and the Cardinal being the slick bird that sheis was fast approaching the yellow arc. I throttled back, leveled thewings, and raised the nose. I then climbed back up to 3000ft. “Goodjob”. He then got out two instrument covers and covered up myartificial horizon and my directional gyro and said, “OK I want youto go ahead and do the GPS approach into Chester County partialpanel, Cardinal N177SM cleared for the GPS runway 29 approach intoChester County via the GOWZO transition, maintain 3000 until GOWZO”.I repeated it back to him and then followed the instrument approachprocedures. It was a near perfect approach. We did a full stoplanding at Chester. I had passed the checkride! After we went inside,he had made some notes about things that I did very well and thingsthat I should be careful of when I actually start flying IFR forreal. He said that the biggest thing you don't want to do isreconfigure the airplane after the final approach fix. He said I onlydid it the very first time during the ILS, that I had forgotten topush the prop full forward while I was in the hold and waited tillthe FAF but that I did it correctly the other two times. He also saidthat during the VOR approach, I remember to start my timer and I wasdoing 90 kts indicated but that I was only doing 75 knots groundspeed and that I should have adjusted my time to better take thatinto account and that is why I arrived at the MDA early but otherthan that, he was very pleased to see me wait for positive courseguidance before descending. He also said that since I was cleared todo the VOR approach, that I didn't need to time the one minuteinbound since I would be proceeding the rest of the way inboundanyways but that was only a minor point. He just suggested that itcould be a distraction in real life IFR. Other than that, he justcautioned me that yes, although I have my IFR ticket, I can legallyfly IFR to minimums now, but that I should set my personal minimumsmuch higher for now till I acquire much more real in the soup IFRtime before I start doing full approaches in IFR conditions. I feltthat the checkride went well and it was actually a lot of fun! Cantwait to file my first real IFR flight plan! I just want to thank everyone who was so instrumental (haha! get it?!......) in helping get my IFR rating. Shannon for putting up with me, my safety pilots, Robert Shackleford, Mike Wallin, and Justin Shumaker, my faux checkride examiner Kevin Nixon (you owe me a high performance endorsement son! ), and an awesome flight instructor, Mark Fischer! All of us, one time or another, are going to make a mistake. It might be a big one or a little one, but its gonna happen. Today, I had my little mistake. I am currenly working on getting my IFR rating and only have about 6 hours of simulated instrument time left before he checkride. So today, I set off with Shannon and Mike on a cross country trip to KUNV, State College Airport at Penn State University. It couldn't have been a more perfect VFR day, I was dissapointed i'd be under 'the hood' for the whole trip as I've never flown up that way before and it was as severe clear as clear could be. Even the winds at 6000ft were less than 10 kts. and so, not really seeing anything out of the ordinary I moved on to checking the FAA's TFR website for any TFR's (since trying to decipher a RAW TFR NOTAM is nearly impossible) but found nothing. I was so excited, this was going to be a great flight. So moral of the story? Check ALL the NOTAMS next time. So since I have started my Instrument Training, I have found the entire business of holding and approach procedures and SIDs and STARs and etc etc etc ... all of it really, quite facinating. Its just amazing to me that we as humans have developed a method (that in essences is really quite simple) to allow us to take off in an airplane in bad weather and fog, fly somewhere, and land. Obviously the 'heavy iron' pilots can do a little more than I can do in my Cardinal, but they impress me even more when they're landing at over 150mph with runway visual ranges of only 2,000 ft.
One thing that I have started to do is to tune into BWI tower (through LiveATC.net) on bad weather days and listen to these guys landing and departing. When I hear something interesting, I write down the date, time, and frequency so I can go home later and re-listen to it in greater detail. Last Monday and this past Monday, Dec. 10th and 17th were particulary nasty days. It was heavy fog the entire day and I posted on Facebook the BWI METAR as a "QUIZ" to the people who follow the Harford Air facebook page. It started a really interesting discussion about Runway Visual Range (RVR) requirements and so I thought that I would post a little bit of audio that I had 'sticky noted' for myself. I think everyone, especially Mark Fischer and James Schlegel, will really enjoy the somewhat ammusing conversation a pilot and BWI tower had with each other about RVR requirements.It is two part audio. I have placed it on the Audio Recordings Page at the very bottom. Enjoy! Hello faithful followers. I appologize for not posting in a long while, but i've been busy! Yeah yeah, likely excuse, but its true. I bought an airplane, got married, started my Instrument training, and now its 'the holidays.' Any free time that I have had, has been focused on either my photography, studying for my instrument written test, or actually flying! Well, tomorrow is my first trip into the SFRA with it and I am super excited, because I am going to visit my friend Cyrus, another airplane nut! Supposed to be beautiful weather! I hope to make a short post soon on my trip to NYC up the Hudson River. I learned a lot from that trip and I have a lot of good pointers for people that are thinking about doing it sometime soon. Until then, Happy Flying! Well, it sure has been a while since my last post and to my faithful followers (Duane, Rob, Mike, Roy, etc) I have a new post! (and there was much rejoicing). 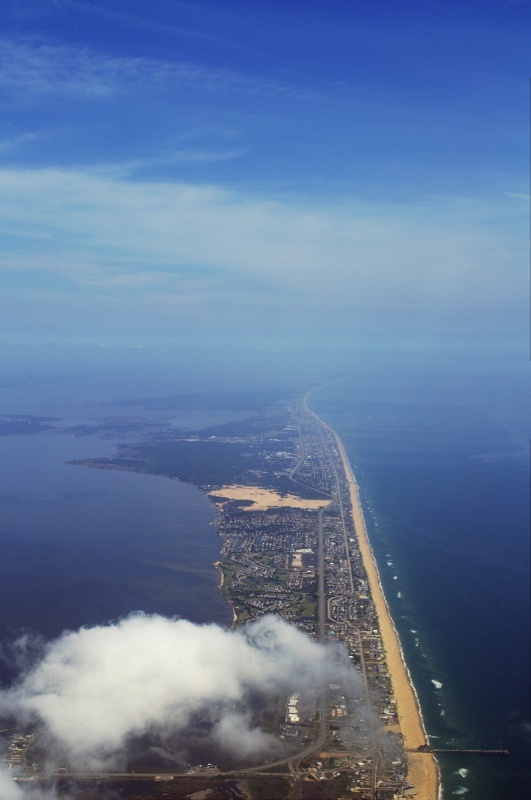 Anyways, I am excited about summer flying and although I wont be able to see the skyline of Atlantic City from 3,000 ft above Harford County Airport anymore due to severe haze (laughably 'light' for our California friends out there) My flying possiblities are increasing. I actually have a few 'real' trips to go on as my cousin's graduation party is in July and I'll be flying to that. They live in upstate NY so that will be a nice trip. My parents want me to fly them down the Hudson, another nice trip. Hopefully i'll be the proud co-owner of an airplane come mid fall and I can start my instrument training, but in the mean time, practice and fun flying are my summer goals. Do some SFRA, maybe go into the FRZ, go to the beach, and land in the grass! If you have any summer flying plans, I would love to know. Post a comment below! Saturday, I had the chance to do something I have been wanting to do for a long time. A long cross country trip to the outter banks of North Corlina. Steve Kauffman, a friend and fellow pilot at Harford had invited me along and I jumped at the chance. On Friday, the weather was looking 'iffy' and there was not only a possiblity of scattered thunderstorms Saturday in the afternoon, but it was looking like fog in the morning. Saturday, I came to the airport around 7am and the entire eastern shore was IFR in dense fog. However, it was quickly moving out towards the ocean and the line of rain showers and thunderstorms to our west was moving very slow at approximately 30-35 knots. After analyzing our options, we predicted that we could stay west of the fog on the eastern shore on the way down, and turn around and come back to beat the storms by a few hours. We departed around 8:30 or 9. The flight down was terrific and I sat happily in the back of the airplane, snapping away with my camera and new 55-200mm lense. As always, whenever I am in the air, I am fully engrossed in the experience. Even as a passenger, I love it all the same. The weather was absolutely fantastic and the low lying fog was all but gone as we got about 15 miles south of Ocean City, Maryland and headed down Cape Charles towards the Chesapeake Bay Bridge Tunnel and Virginia Beach, VA. We continued to follow the coastline down, originally at 5,500 ft and then dropping to 4, 500 as our heading passed 180 deg. Somewhere about 20 miles south of Kitty Hawk, we had to make the decision to continue on to Ocracoke or stop shorter at Cape Hatteras. 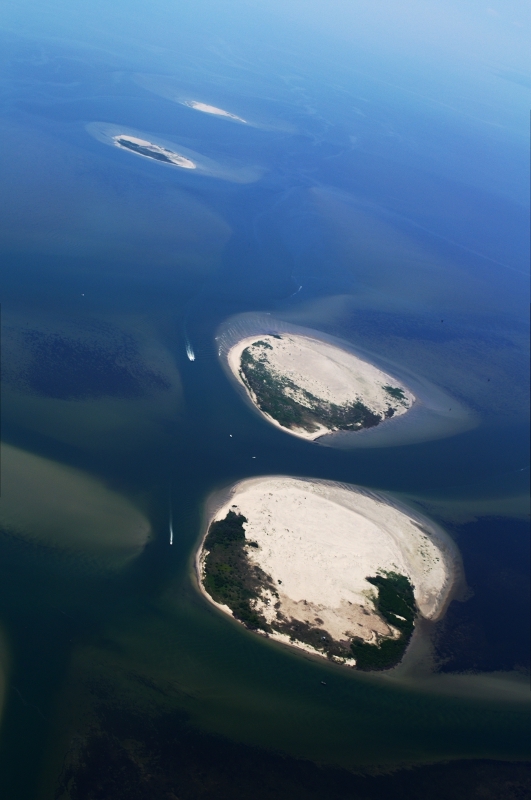 In order to make it to Ocracoke, we would have had to fly direct from where we were over a large expanse of open watter and unfortunately, Washington Center could not see us on their radar any longer and had nobody to hand us off to. Unwilling to chance our fuel situation since neither Ocracoke nor Hatteras sell fuel, we played it safe and landed at Hatteras. Hatteras' airport was bare bones at best. No bathrooms, only a small shack with a signature book and a computer for checking the weather. We could see that the storms were getting closer than we would have liked and so it was time to depart. 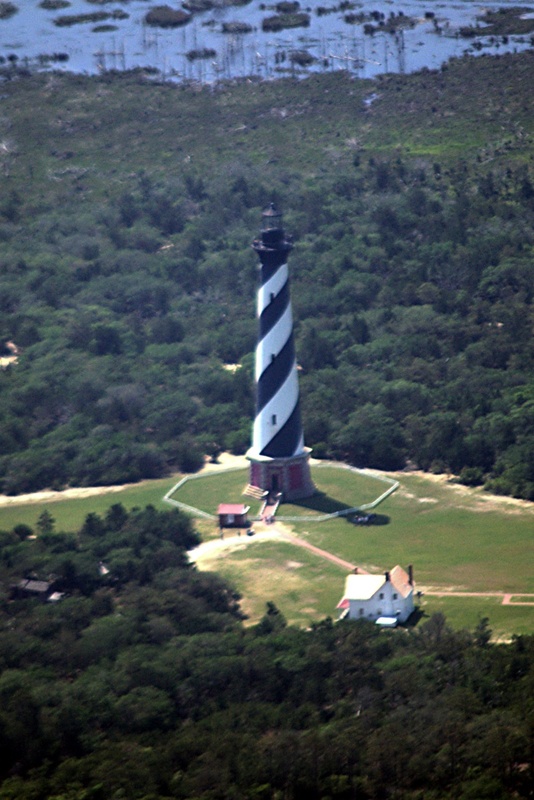 We then preceeded to Dare County airport, 50 miles north of Hatteras to fuel up and switch seats, it was my turn to fly. The first 80 miles were uneventful and we could see out our left window most of the major storms we were trying to avoid and we got north of the worst of it around Norfolk, VA. At this point, I had a decision to make as I could see some cumulous clouds building ahead of me about 20 miles out. Should I go up the coast towards Ocean City, MD like we came, or go up the western side of the Easten Shore? I decided to go west and hugged the left side of Cape Charles. About that time, a Bonanza that was also flying in our general direction had long passed us and was approaching the Snow Hill VOR and encountering MVFR conditions and filed an IFR flight plan to Salisbury, MD instead of his original destination of Ocean City. This is where things started getting interesting for us. We had already been handed off to Patuxent Approach and about 10 miles north of Cape Charles VOR, Patuxent recommended that we head direct to Harford if we planned to beat the storms. I then set my sights on Tangier Island to avoid crossing too much of an expanse of water in our single engine taildragger. As we got closer to Tangier, visibility dropped from the 20 miles we had before, down around 7-8 and I was crossing my fingers it wouldnt get any worse. From Tangier, we went up towards Smith Island. About 25 miles north of Tangier, visibility was getting very poor around 4-5 miles and it was starting to become difficult to see what lied directly ahead. Before we knew it, we had flown right into a cloud and popped out the other side only 2-3 seconds later. That was it. Time to find a place to land. I listened to the Cambridge AWOS as that was our nearest alternate airport (20 miles north east). Cambridge was calling 5 miles visibility in haze and broken clouds at 1,800 ft. Steve pointed out Chesapeake Range airport to our west but that was private. St. Mary's was the next closest at 25 miles west. St. Mary's AWOS was reporting much better conditions and I told Patuxent we were diverting. They cleared us through all restricted airspace but told us to remain outside the PAX NAS class D.
On the plus side, I made a nice wheel landing at St. Mary's and we taxied over to the terminal building (which was closed) and we checked the weather sitting on the benches outside. We debated to either file an SFRA flight plan and try to make it up the Western side of the Bay or hug it over to Bay Bridge airport. The radar was showing storms closer to the western side of the bay and Bay Bridge was reporting relativley clear weather so I decided we should strike it out for Bay Bridge. We didn't get very far and at 15 miles north of St. Mary's the ceiling was low, visibility was even lower, and you couldn't see where the water ended and the sky began. I was really starting to get nervous but it was nice having Steve with me as he said "Aaron, I'm calling it!" I was so focused on flying the plane, I asked him what he meant. He said "I'm calling it, this is not gonna be safe" he was right and I agreed 100%. We told Patuxent approach that we weren't going to make it to W29 and were turning around again. Now we felt stuck. The radar was looking really bad and we were stuck, two VFR pilots in a VFR airplane. We tied the Citabria down at St. Mary's and hung around the FBO lounge for a few hours. We finally convinced Kevin Nixon to fly the Cessna 172SP down IFR to come and get us. We were going to leave the Citabria there and come back either the next day or Monday to get it. We wanted to be 100% safe. Kevin made it to us about an hour later and said that except for a few low vis areas and a very light broken layer of clouds at 2,500 ft, it was VFR back to Harford. We then got back in the Citabria and I let Steve fly, as he has more experience than I do, and we followed Kevin out to the north back to Harford. Once we got about 15 miles north of St. Mary's, the air was clear and you could see for 20 miles. We flew VFR above the light broken layer all the way back ensuring we could see houses and land down below us all the way up to Turkey point and dropped down through a break in the clouds. We were back, safe and sound at Harford. This was a real learning experience for me as it was only the second time I have diverted due to weather. I learned more about ADM and CRM than I have in the last year of flying and I got to enjoy a beautiful flight to Cape Hatteras, and a nervous flight home. All the while, Steve and I remained safe, made all the right decisions and made it out alive. Thinking back, I wonder what I would have done different and really the only thing I can say I might have done was tried and filed a FRZ flight plan to Potomac Airfield and maybe hop-scotched my way up to Harford County, but even that would not have guarenteed a quicker or safer return. Either way, I can't wait for my next great airplane adventure! Thanks Steve Kauffman for the memorable trip! Ever since I was little, I have been fascinated with airplanes. Like many other people, I wondered what kept that big heavy machine in the air. I knew that the air kept it up but I didn’t know how. It was like magic to me. As I grew older, my curiosity only increased. I always wanted to keep learning about them. I would look at pictures, read books and magazines, drew them, and even dreamed about them. My infatuation grew and I went to college to become an aerospace engineer. I wanted to learn everything I could about these fantastical machines. In graduate school, I had had enough waiting around, and I dove in head first and started learning to fly. I had been up for rides in small airplanes before, but never able to sit in the pilot’s seat. I remember how surreal it was hearing the controller say “Cleared for takeoff, runway 33 right” and my instructor echoing the phrase back over the radio as we taxied onto the runway and lined up. He let me take off, all the while, his hands still assisting with the controls. The rush of adrenaline I felt as I pushed in the throttle and accelerated down the runway was nothing compared to the point when we pulled up, and the wheels left the ground. I was up in the air and flying an airplane. Only 15 hours later, I soloed. My instructor stepped out of the airplane and said “Don’t forget to come back down and pick me up! Good luck!” My heart raced and as I left the ground, all I could think about was “I am flying an airplane by myself! I am flying an airplane by myself!” The feeling as the wheels left the ground hadn’t diminished. My family and fiancée laughs at me because I take every opportunity to turn every conversation into ‘airplane talk.’ I can’t help it and I try very hard not to annoy them with it, although I probably do. My favorite thing to do, is to take my family and friends flying, especially my friends who have never been in a small airplane before. I want them to feel the magic that I still feel. Even to this day, I get that adrenaline rush the first time the wheels leave the ground. It is like my first flight all over again. It doesn’t happen often but there are times when I haves cheduled the airplane, planned the flight, and right at the last minute, I have to make the go/no go decision due to weather that is already happening and in the rare occasion, weather that will possibly be happening during my flight.My trip up to Summerset airport in NJ to pick up Shannon was such a flight.This 95 nautical mile trip (each way) would be starting just before dark with a planned,beautiful night flight back to Harford County. I have night experience, no doubt, and I went up last week to get in some night practice that included my three take-offs and full stop landings to be night current (read previous storycalled ‘Night Currency’ and I have quite a bit of cross country time (morethan ¼ of my total hours) and I have flown this route twice before. I was very confident that this was going to be a ton of fun and I have been looking forward to making this trip for a few weeks now. Yesterday, however, I woke up, got my cereal, and turned on the weather channel, my normal routine. After two weeks of them saying that Wed was going to be sunny and clear, I was surprised to hear they were calling for showers Wed afternoon through overnight. It was a 30% chance and so I thought I would still go, but track the weather throughout the day to ensure things weren’t going to get worse. This is where my ‘aeronautical decision making’ came into play. Throughout the day, the forecast stayed the same but then as the 36 hr forecast became the 24 hour forecast, it was clear to me that the chances of rain were much higher and it isn’t so much about flying in the rain, as it is clouds or visibility. If you are like me,you get AOPA’s ePilot stories in your e-mail or the flight training edition.You read stories all the time of people that either had accidents or got themselves into situations that could have turned out poorly. The one thing they all have in common, is that the pilot made a decision that led him/her further down the rabbit hole of danger until things got too tight to back out and the only way left was forward. Thinking about this, I realized that, yes,If I was making this trip during daylight hours, I would totally go for it. I have flown places and waited for weather to pass and I have flown around weather that I have seen in front of me too, but at night, the story changes. It is near impossible to see approaching weather when you are in the air unlessyou have XM Weather, a stormscope, and possibly a full moon. Well, I don’t have XM weather, or a stormscope, and tonight is only 2 nights prior to what is known as a ‘new moon’ which means…..the moon isn’t even going to be out. So I would most likely be able to make it to Somerset without a problem, since it would still be light out, but if I was coming back and the visibility dropped to near zero, or I accidentally flew into low overcast (generally associatedwith rain making systems) then I could find myself in a very poor situation…..at night……in the dark. “BUT” I was thinking to myself, the weather is only supposed to be around MD and the lower portion of PA, I could always divert to Martin State, or Carroll County right?! But the pit of my stomach said ‘no stupid, you don’t have an instrument rating, what happens when things become IMC on you?’ I was/am sooooo looking forward to this trip. So what did I do? Iasked a fellow pilot who has roughly the same amount of experience as myself, what he would do if he were planning on making the trip. Long story short, he said “no way” Slightly despondent, I knew all along the answer and I just didn’t want to hear it, but as the famous saying goes, “it is better to be on theground wishing you were in the air, than in the air, wishing you were on the ground” So I called Shannon and told her the conclusion. If it was in the daytime, I would have many more options open to me, but at night, with little night experience in the past 4-6 months other than some take-offs and landings and some light gps navigating of the Harford County/Cecil County area, this would be ‘risky’ to say the least. Oh well. Just thought I would share that will you all. Maybe I’ll see you at the airport and we can have some dialogue about it! This past Wednesday night, April 11th, I scheduled N12334 with the intention of going up for a few circuits around the pattern to do my required 3 take-offs and 3 full stop landings to maintain night currency. This coming Wednesday, April 18th, I am doing a cross country flight to upper NJ to pick up Shannon and bring her back home for a meeting she has early Thursday morning. She doesn't get out of class on Wed till 6:30 so it would be cutting it close if I tried to race back to Harford county in the approaching darkness. So, to save myself embarrasment or the possibility of violating a few FARs, and for my own benefit of practice and currency, I went to the airport. The whole day, the weather was looking really iffy for my night 'self lesson' and the forecast was calling for Winds 330 @ 15 G18. As many of my fellow pilot friends know, I am comfortable with 18+ if I am by myself or with very experienced passengers but generally I will just stay on the ground wishing I was in the air and reschedule for another day. However, the weather around here has been really wonky lately and it was anybody's best guess as to when the wind would calm down, and knowning my luck, it would be foggy for the next 7 days, potentially putting me into a position i'd rather not be in. So I thought I would at least go to the airport after work, check out the situation for myself and make the call as the sun set. I do have to thank Robert for reminding me how windy it actually was but I wouldn't say it was gusting 18 quite yet (15 very intermittently probably) and the wind sock was more or less down the runway so I made the call to go up. After a thorough pre-flight and an extended run-up, I taxied back down the runway and did something I sure love doing, which is clicking that mic button 5 times and seeing the whole world light up. Its so cool. I turned around and lined myself up down 28, saying to myself, "compass, DG, mixture, brakes, full power, RPM, suction , fuel, oil pressure, oil temp, no high voltage light..... here I go" and dropped my heels to the floor and steered down the runway. I knew it was going to be some hearty practice when the nose swung to the right as the wind shifted from about 300 to 330 and I started bumping all over the place. "oh boy" I said to myself sarcastically over the headset. Downwind, base, final, and I don't care who you are, but if you're coming into Harford at night and haven't done it in nearly 3 months, you thank Kevin Hess for fixing those PAPIs and make sure they are blinking back and forth between red over white and white over white. Those trees start to become disconcerning when the tops start to be light up by the landing light. First landing was a floater. I flared and just stayed in the air for what seemed like forever (maybe 300 ft) as I had maybe 20 gallons in the tanks and without passengers. But I heard "chirp"...."chirp" as I touched down. Next landing was, in my opinion, my best one of the evening, but I did bounce ever so slightly as I touched down a little fast but a much more stabilized approach. As I went up for a third (with plans to do a total of 4 or 5 take-offs and landings total) the wind started shifting back and forth between about 280 and 330 and the sock was starting to flap up and down. I would say it was 12 gusting 15 with the periods between gusts a lot closer together now, and I could tell when I turned final because the plane rose way up as I came over the trees and then stared sinking fast as I approached the road. I throttled up and the wind started bouncing me around quite a bit. I was going to give it a few more seconds before just going around and right as I crossed the telephone wires, it all settled out and I set her down gently but firm. I thought I better not push my luck so I settled for the 3 and taxied back. Of course, after I tied the plane down, the wind died down.... but it was very good practice and a good lesson. I highly recommend going up for some night practice in the wind as I think us pilots dont practice it enough. I'd rather have another pilot with me next time to give some pointers or some "here's what I would have done differently" perspective. So, I'm ready for my trip to Somerset, (changed from Morristown to avoid Signature charging me $30 handling fee on top of $11 landing fee) and I am excited about doing a night cross country. I am going to spoil myself though and take the "SP" because I want panel lights!